Shereen is hosting 'Sew Fun Fridays' for sewing projects, and lucky for me, also other craft projects. I 'sew' wish I could sew. 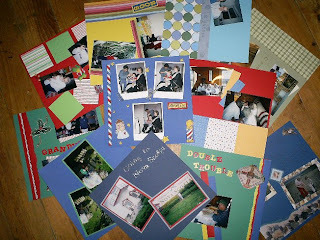 :o) But I seem to be better with tape, so I thought I would share the pages I am working on for my mom's birthday. The pages are pretty much finished. All I have to add is journaling and maybe a few more embellishments. Then I'll make more pages for her to add to her album. Sorry, for the collage type photo, but I wanted to try to include all the pages I have for her album. 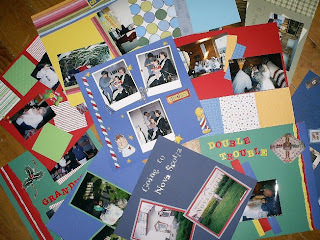 If you are working on a craft project, stop by Shereen's blog and add your link. Posted by Lisa at 8:36 p.m. Anyway, very beautiful! Look forward to seeing more projects! March 4, 2007 at 11:39 a.m.
March 4, 2007 at 5:44 p.m.
March 5, 2007 at 11:44 p.m.